The idea that getting you and your groomsmen outfitted for your big day shouldn't be this difficult, and you shouldn't have to break the bank doing it either. If only someone was there to make the process simple - this was how Wingmen started. We provide a personal shopping experience that makes it easy - everything from making sure your suits fit to getting the right colours to match the bridesmaids. Our suits and packages also come at an affordable price point, so why rent when you can own the suit? We're your Wingmen for you and your wingmen! On arrival, our styling specialist will welcome you to our showroom and take time to learn about you and your big day. We'll then take some time explaining how Wingmen works, and go through the fabrics, fits and styles that we have to offer. You'll choose the style and package that meet the needs of your wedding party. Once suited up, we'll explain what a good fitting suit looks like and make recommendations on tailoring and style. Take some time to hang out with your groomsmen while we figure out everyone's size. You can also try out our ties, bowties, pocket squares, suspenders and funky socks! We'll get everything ordered for you and call you back when it's ready. Try on your new suit! 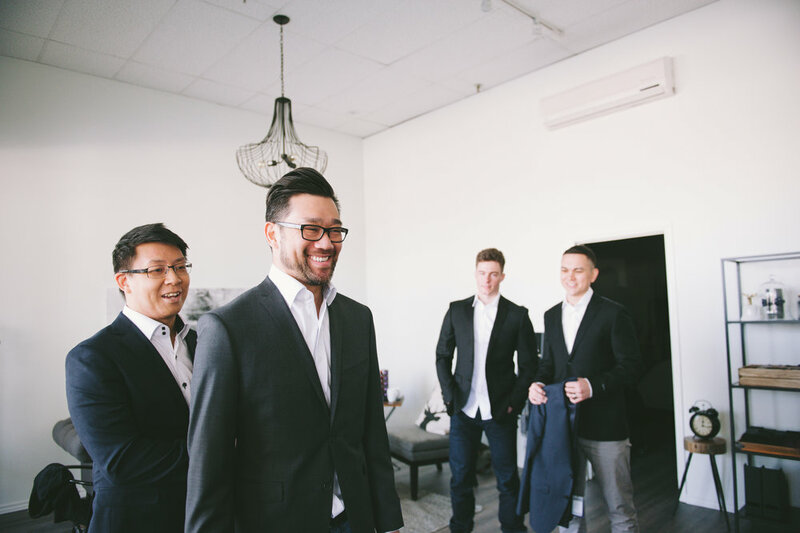 We know everyone prefers a different fit on their suits - our expert tailors will alter your suits to ensure you and your wedding party look perfect for the big day! 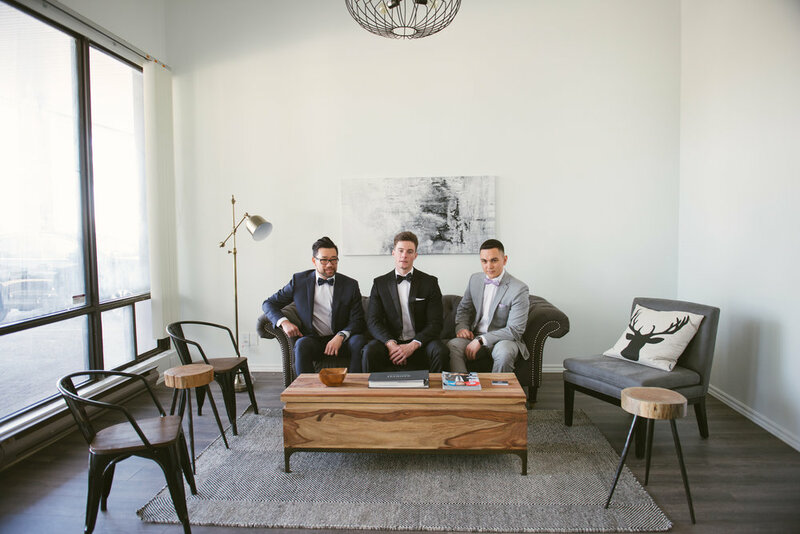 "I had a great experience going with Wingmen Suits for our wedding. I was able to get a great looking Tuxedo that fit me perfect at an affordable price. The same goes for my groomsmen, who also got suits that looked and fit well. The team ensured that we got everything we needed and prepared us well for the big day. Overall, a great place for suits and tuxes!" "My friends love Harry Rosen suits... After visiting with Wingmen they ordered beautiful (I mean very handsome manly) suits for a wedding and looked extremely sharp. They were so impressed with the quality they plan to go back every year as a group to get new suits. " 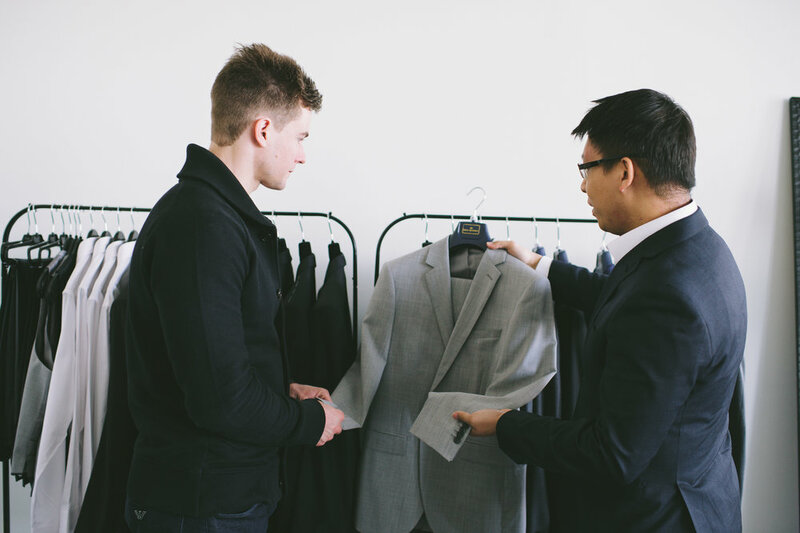 "I had a really good experience at Wingmen Suits. The environment was relaxed and I wasn't rushed at all in finding the perfect suit!" Copyright © 2015, Wingmen Suits Inc.